Peter Hickman set the fastest ever qualifying lap at Dundrod at 133.560mph to take provisional pole in the Superbike class. Smiths BMW rider Peter Hickman set the fastest qualifying lap ever around Dundrod on Thursday as he headed the Superbike times once again. Hickman lapped at 133.560mph to remain at the top of the charts ahead of Saturday’s Superpole session, but Dan Kneen closed the deficit to just half-a-second on the Tyco BMW as the Manx rider lapped at 133.186mph. Dan Kneen also lapped at 133mph on the Tyco BMW to finish half a second behind Peter Hickman as he slotted into second place in the Superbike times. British Superbike title contender Hickman repeated his practice treble from Wednesday as he also led the Superstock and Supersport sessions to mark himself out as the man to beat. Flying Kiwi Bruce Anstey was third quickest in the Superbike session with a lap of 132.948mph on the Padgetts Honda RC213V-S, three tenths behind Kneen and only 0.9s back on provisional pole man Hickman. Former outright lap record holder Conor Cummins maintained his strong form on the Padgetts Honda Fireblade as he slotted into fourth with a lap of 132.651mph. William Dunlop, who is riding with a wrist injury, became the first rider ever to go through the speed trap at more than 200mph, clocking 200.4mph on the Temple Golf Club Yamaha R1. Bruce Anstey was third fastest on the Padgetts Honda RC213V-S.
Dunlop was fifth fastest overall at 132.606mph, despite being forced to stop at the Hole in the Wall, missing the final 15 minutes of the session at least. His brother Michael also stopped on the Bennetts Suzuki at the Lindsay Hairpin. 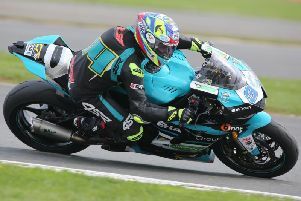 The 28-year-old’s lap of 132.369mph kept him in sixth place ahead of Dean Harrison on the Silicone Engineering Kawasaki, who lapped at 131.639mph. Dave Johnson was eighth quickest on his BMW followed by Dublin’s Derek Sheils (Cookstown B.E. Racing Suzuki). William Dunlop became the first rider ever to clock 200mph at the Ulster Grand Prix on the Temple Golf Club Yamaha. Yorkshire’s Jamie Coward rounded out the first ten on the Radcliffe’s BMW (130.351mph). Earlier, Hickman narrowly held on to secure pole in the Supersport class on the Trooper Beer Smiths Triumph. The 30-year-old lapped at 127.33mph to edge out Harrison by 0.124s, with Anstey in third – 1.5s behind Hickman. Lee Johnston (Padgetts Honda), William Dunlop (IC Racing Yamaha) and Michael Dunlop (MD Racing Yamaha) were the top six. Cummins was next ahead of Christian Elkin (Triumph), while Paul Jordan put in a solid effort in ninth on the IMR Yamaha R6 ahead of Adam McLean (MSS Kawasaki).